Are you sure to know all the tips and tricks about WordPress? This CMS has so many features; surely you know how to create posts, pages, and upload media content. But there are a few less commonly used features that can really help you streamline your work. Here are 10 WordPress tricks you probably do not know. If you run a blog, you surely know that there is nothing worse than not having anything to write, while fixing the blank page in search of inspiration. In my experience, the best way to avoid this problem is to take note of all the ideas that come to mind. It’s on your blog dashboard. 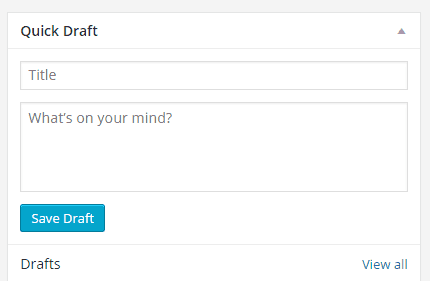 Here you can insert titles, a brief summary of your idea and save the draft. When you back out of ideas, you’ll find some saved projects under your posts. Sometimes, when you create a post or a page, there are options that you just do not manage to find. The trick is to click “Screen Options” in the upper right corner (click the image to enlarge). Here there are many voices to tick, one for each option. When you are logged in your WordPress blog and then you are surfing the live site, the toolbar is always visible at the top. Sometimes, you want to disable it (for example if you need to take full screenshots of your blog or details of the upper part of your site). Did you know that WordPress also has an application for smartphones and tablets? The app is available for both Apple and Android and can be used to manage both sites on WordPress.com or built with WordPress.org. You will manage posts, pages and comments, and also some site settings. Click here to get the official WordPress mobile app. Some people prefer to write their post on a text program such as Word, and only when the draft is ready, transfer it to WordPress. While others (like myself) prefer to write directly into WordPress. In any case, there’s an interesting feature, relatively new. This is the distraction-free writing mode. To activate it, simply click the symbol as indicated in the image above. From time to time, it is normal to be groped by one of the many WordPress themes available. However not always the end result is like the demo. With WordPress, you can test out the themes without actually activating them, using an awesome WordPress option! To do this, install the theme that interests you, without activating it. 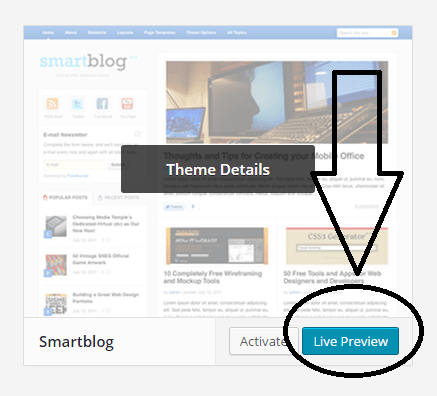 Then click “Live Preview”, as indicated in the image below. You’ll work on the customization options and see the live preview of your changes. It’s always a good idea to back up your site: there might be any kind of problems with updates, or a hacker attack, or even a mistake on your part. The absolute fastest way to make a copy of your content (be careful not the entire site, only the WordPress data: posts, pages, custom post types, comments, custom fields, categories, tags, custom taxonomies, and users) is through the “Export” option, included in your WordPress dashboard, under “Tools” option (see image below). On this subject, read the official specification. The videos are a great content to be integrated on your posts. Until some time ago, to insert a video into your content, it was necessary to copy and paste the embed code on YouTube (or Vimeo). Now it is not like this anymore! In fact, you simply need to copy the URL of your favorite video, paste it directly in the Visual Editor and WordPress will do all the rest of the work for you. Many WordPress users may be wondering how to insert images in the sidebar. In fact, most of the themes do not have a specific widget for images. The good news is that you do not have to install any additional plugin. Now save the widget and you’ll see the picture in the live version of your site. 10. WordPres Allows You to Use Many Shortcuts! A shortcut is a combination of keyboard keys that, when pressed together, perform a specific action. For example, Ctrl+C is used to copy a selection of text, and Ctrl+V serves to paste it. WordPress has many keyboard shortcuts, especially useful for formatting text. Life is a never ending learning process, and so it’s WordPress! In this guide we saw today 10 tricks you probably did not know. Have you ever used these features or did you find them out today? Do you think they are useful? You just have to test them and be sure to let me know what you think in the comments! And remember to share the post, if you enjoyed it! I’ve been using wordpress since 5 years now and I guess I didn’t knew few of the mentioned tricks and I guess I’m gonna have to note it down. It wasn’t long ago that I learned to show more than 20 posts from the Screen Options. That has made things so much more convenient when managing posts in bulk. We tend to explore new options only as we need them, but it’s also good to learn extra tricks in case we DIDN’T know we needed them too, if that makes sense. sometimes we just need to dig a little more! Glad you liked the post, thanks for reading and commenting. These are great simple tips and tricks for the new WordPress user! Thanks for sharing it! .. it will help a lot of new bloggers around here! Thanks for reading the post and for leaving your views. I have been using WordPress for a long time but there are some features shared here I am not even aware exist. Specifically, I am just learning of the Quick Draft, Turn Off the Toolbar When Viewing the Site as Admin and How to “Export” Your WordPress Data features. I guess its time to get practical with these tips. Indeed, there is no limit to learning with WordPress! 😀 Thanks for sharing this revealing piece! I wrote this post with the aim to give some “unusual WordPress tips”. I have to say that #1, 2 and 7 are my favorite and I didn’t know of number 2 for sure. I may play around with that one and see. You’ll see, with screen options, you’ll “discover” some new interesting features! That’s an useful post. You are right. Someone will find these useful for sure because I remember how lost I was to look at the WordPress dashboard when I started out. Now all these tricks seem too familiar to me. But they should really help someone who is not so familiar with WordPress. but I hope some new bloggers will find them useful! The first I just checked after reading this post is, Screen options which has pretty options to and I guess I’ve learned some great trick today. Good to hear that, Mark! I just figured some new tricks that i didn’t know before, It will be now very helpful to me and others so well. keep going your nice post. Good to hear you learned something new, Azad! How you doing ? Its been a long time didn’t speak with you 🙂 . Once again you’d given simple and best post that actually helps people who are beginner to know about what tricks to apply in their word press site. I feel that there is no much technical, but it definitely simple stuff that applies to all . Few of points I know well, but few tricks like 8 ( Integrating you tube and vimeo. Let me have a try on that and see how well it works. Do you’ve more deep about it ? Business is increasing, which is really good. I’m glad you pay a visit here, from time to time. Happy to hear you enjoyed the reading. I plan to write a more in deep post about WordPress tips. I hope it will be the first of many of your comments. Great post, Erik. I really don’t know the 1st and 9th trick, they both seem useful stuff in WordPress. I aware of other tricks, especially some of the WP shortcuts. I was scaring to blog with WordPress during my initial days of blogging, but now I’m familiar with its most of the features. Good post, have a happy weekend. good to see you discovered some new WordPress features, thanks to this post. This is quite interesting topic to share with others. I just love all 10 points, especially the point number 3 is really helpful to me. It’s kind of annoying toolbar and every time I thought, how to remove that toolbar. And today I got the solution for that. Thanks for this informative points. Glad you discovered a new WordPress feature here. I learn two tips from your blog post 1st Quick Draft & 2nd Shortcut key for wordpress. I like to work with shortcut keys. Generally i avoid use of mouse while i am working laptop or desktop. 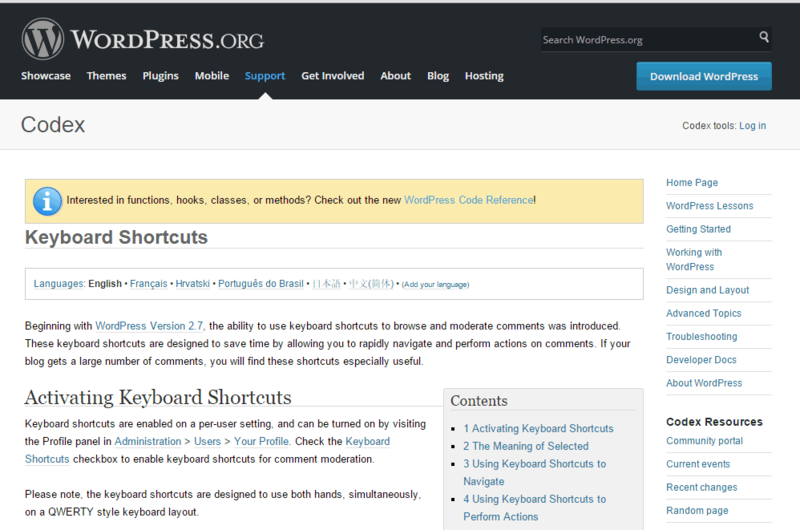 I alway eager to find shortcut keys for wordpress and here you shared it. That was the aim of this content. Nice collection of wordpress tricks, I’m using wordpress for all my blogs and I’m loving it. You revealed some cool tricks in WordPress and reminded me of some options. Talking about WordPress Mobile app, I see people complain about bugs and compatibility issues. Have you used this app on your phone? I want to know if you experienced any issue with the mobile app. I’ve never heard of that WordPress Mobile app, I’m using “WPTouch” plugin for one of my niche sites (free version) and it’s awesome. May be you can give it a look? The only problem when on earth I use Quick Draft is that at times I fail to recall continuing or checking the draft. But yes, it is a good idea to write down notes whenever you’re lacking a bit of inspiration. 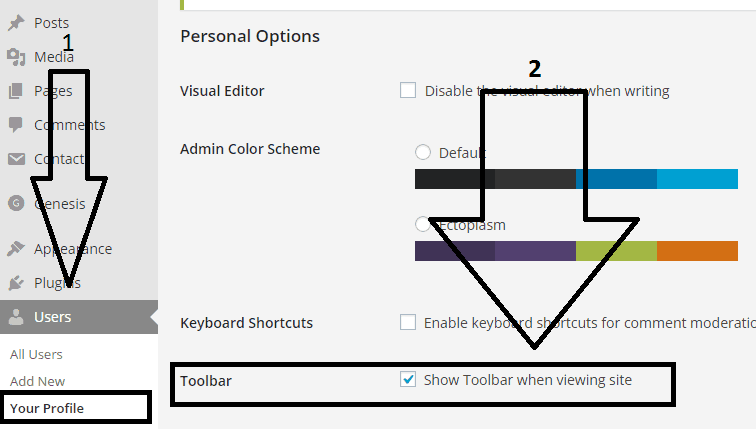 “Turn Off the Toolbar When Viewing the Site as Admin” this is useful and helpful if you want to edit your website. You don’t have to click back or go back just to find edit or what. Simple trick, but helpful. “Distraction-Free Writing Mode” is one of my favorites here. Newbies are very prone to distractions and this trick will probably help them focus and finish the work productively. All in all, these are awesome simple WordPress tricks. Thanks for sharing. good to hear you learned something new with this post. Thanks for checking out and I appreciate your comment. Very informative post on some really great features of WordPress! Those seem to be small but have greater impact if used effectively. Great content! And I m happy to share it! distraction free mode is awesome! Aside from quick draft feature, I use sticky notes of Windows. Great for writing down things to do or lists, or even post ideas. Thanks for checking the post and for leaving your views. These are awesome basic tips and traps for the new WordPress user!Now every one of these traps appear to be excessively well known, making it impossible to me. Be that as it may, they should help somebody who is not all that acquainted with WordPress. hope to have you helped! Nice article for developing and managing WordPress site in niche. This list of information can help the programmers to modify any page without any hesitation. Also for building a plugin this can also help to rebuild the construction of a page.